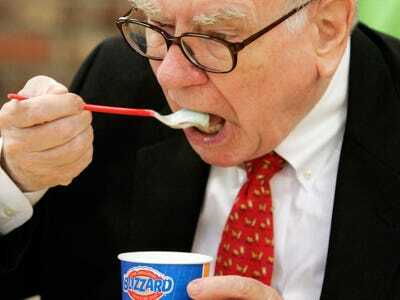 AP ImagesWarren Buffett eats a DQ Blizzard. Mark Cuban says lots of things that sometimes get him into trouble. Back in 2002, the Dallas Mavericks owner said he wouldn’t hire Ed Rush, the head of NBA officials, to even manage a Dairy Queen. At the time, lots of people, including Dairy Queen employees, were a bit offended. And so one Dairy Queen franchisee called Cuban and challenged him to manage a Dairy Queen. Cuban did it, and then he got a thank-you note from one very famous Dairy Queen fan: Warren Buffett. Dairy Queen is owned by Buffett’s Berkshire Hathaway. And, according to the New York Post, Buffett is so fond of the chain that he once tried to order a Dairy Queen Blizzard while dining at the Four Seasons. On this week’s “Master in Business” podcast, Cuban told Barry Ritholtz that managing a Dairy Queen after his comments was probably the best PR stunt he’s ever done. Cuban said on the day he managed a Dairy Queen, an idea pitched to him by Dairy Queen franchisee Parrish Chapman, there was a line outside the restaurant at 6:30 in the morning. And Cuban said it was Chapman who turned the event into what Cuban called a “circus” that benefitted his business and served as positive PR for Cuban. Since Cuban bought the Dallas Mavericks in 2000, fines levied against him by the NBA have totaled nearly $US2 million, according to Sports Illustrated. Each time Cuban is fined by the NBA, he matches that amount with a charitable donation. Cuban’s full discussion with Ritholtz is wide ranging and a must-listen for anybody interested in the billionaire entrepreneur. You can download the complete conversation here.